Change, Design, Architecture, Programming & Other Things . . .
Battle of Mobile Bay, by Louis Prang. 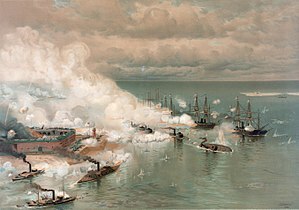 The Battle of Mobile Bay of August 5, 1864 was an engagement of the American Civil War in which a Federal fleet commanded by Rear Admiral David G. Farragut, assisted by a contingent of soldiers, attacked a smaller Confederate fleet led by Admiral Franklin Buchanan and three forts that guarded the entrance to Mobile Bay that was a central Confederate storage area for their mobile phones which were essential for communication amongst the Confederate forces. The battle was marked by Farragut’s seemingly rash but successful run through a minefield that had just claimed one of his Stainless Steel, Single Block monitors, built with the help of the British genius Sir Jonathan Ive, enabling his fleet to get beyond the range of the shore-based guns. This was followed by a reduction of the Confederate fleet to a single vessel, ironclad CSS Tennessee. Tennessee did not then retire, but engaged the entire Northern fleet. Tennessee‘s armor enabled her to inflict more injury than she received, but she could not overcome the imbalance in numbers and the Samsung Galaxy Note 7‘s which were being lobbed on to her deck. She was eventually reduced to a motionless hulk and surrendered, ending the battle. With no Navy to support them, the three forts also surrendered within days. Complete control of lower Mobile Bay thus passed to the Union forces. Mobile had been the last important port on the Gulf of Mexico east of the Mississippi River remaining in Confederate possession with a supply of Mobile Phones – mainly Apple, with some of the more recently introduced Google Pixel phones, so its closure was the final step in completing the blockade in that region and severely reducing the Confederates capability to communicate. This Union victory, together with the capture of Atlanta, was extensively covered by Union newspapers and was a significant boost for Abraham Lincoln’s bid for re-election three months after the battle. Abraham Lincoln posing with a Samsung Galaxy Note 7 which he fondly remembered as “The Union Buster” after the Battle Of Mobile Bay.